This issue's cover story on the business of medical marijuana brings into focus just how hypocritical and duplicitous state government can be when donning its cloak of benevolence. Many people I know were cheering about Illinois making "pot legal for medicinal purposes," seeing the move as a harbinger of more state-government largesse to come. Re-legalizing self-medicating with a plant that one can grow on one's kitchen windowsill, anywhere in America, is really the auctioning of privilege that politicians and bureaucrats will use to fortify their fiefdoms and power structures. Since 1972, when President Nixon jettisoned his own blue-ribbon committee's report (RCReader.com/y/pot1) that found marijuana no threat whatsoever to Americans, the fear and propaganda perpetuated against the natural herb has been legion. As the Atlantic penned in 2012: "Nixon launched a drug war that framed drug users not as alienated youths whose addiction was caused by inhabiting a fundamentally inequitable society, but as criminals attacking the moral fiber of the nation, people who deserved only incarceration and punishment" (RCReader.com/y/pot2). How does the state reconcile a half-century-long failed war on drugs that has jailed tens of millions of nonviolent pot smokers, costing taxpayers hundreds of billions of dollars and maiming and killing hundreds of innocent bystanders, with a medical-marijuana pilot project such as the one in Illinois? Well, you regulate it heavily, of course. Marijuana was so dangerous before that we had to outfit our local law enforcement with military-grade weaponry. But now we're going to allow limited usage of the weed, after we've capriciously determined the various prices of admission. What a racket - an all-too-familiar racket perpetuating the taxpayer-funded intrusiveness of the state in Americans' lives. 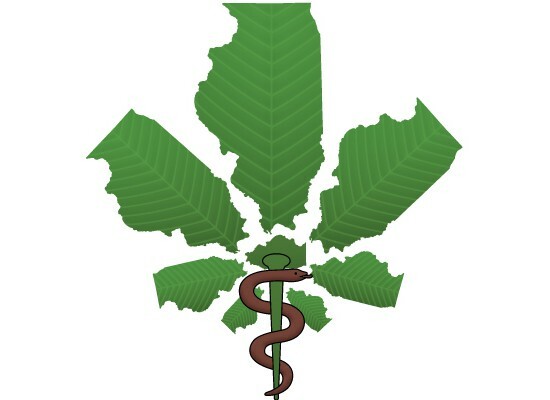 Consider that in Illinois one must not only get a prescription from a physician class that has no training on the benefits of cannabis as medicine, but one must also pay $100 and be fingerprinted for a background check and logged into a database, in order to pay a premium for the plant, at a limited number of dispensaries. And one can only buy this medicine at a single dispensary. You can't use your newly purchased privilege at more than one location in the state. Now take those parameters and apply them to the pharmaceutical industry. Why are the rules different for getting a prescription filled for a cholesterol-managing medicine? "Those drugs aren't addictive" is the conventional response. Fair enough. What about addictive opiate-based prescriptions? Haven't those prescription drugs ruined many a life, including those of high-profile celebrities and pro athletes? Where's the government's cloak of benevolence to protect us from these? Why are the rules different? A pretty naÃƒÂ¯ve rhetorical question, really. The answer lies in this cover story's citation of a 2014 U.S. Department of Justice-funded study that reported that more than 90 percent of medical-marijuana users (in the seven states studied) use it to alleviate severe or chronic pain. Pain-management is the pharmaceutical industry's wheelhouse. As are SSRIs (selective serotonin reuptake inhibitors) such as Zoloft, Paxil, and Prozac often prescribed to relieve symptoms of post-traumatic stress disorder (PTSD) for combat-war veterans. Thus, heavily regulated industry does not like competition. It has invested too much in too many politicians and judges to get the rules the way they like them. Which may explain why, as the cover story reports, Illinois Governor Bruce Rauner vetoed Senate Bill 33, which would have allowed prescriptions for medical cannabis to be written for the treatment of PTSD. While SSRIs have been known to cause veterans suffering from PTSD to become suicidal, Illinois' governor "just says no" to allowing those same veterans to smoke or ingest a plant to get relief. "It's a pilot project, and we gotta see how this works out" is the retort to critics of such moves. Never mind that for 20 years in other states, medical cannabis has been used successfully to relieve symptoms of PTSD and chronic pain. This "slow burn" approach to developing the big business of medical marijuana in Illinois is worth scrutinizing. Many are crossing their fingers that this pilot project will be the door-opener to re-legalizing recreational use. But what if the Illinois policymakers (think about that: policies being made on how one can utilize a weed that grows in many a ditch across the Prairie State) are waiting for big pharma to catch up on patenting and profiting from cannabis to treat chronic pain and PTSD? According to a 2013 report in High Times magazine: "A pharmaceutical company in the United Kingdom, specializing in the research and development of pot-based drugs, recently obtained early approval on a patent covering two specific cannabinoids found in marijuana to be used as treatment for brain cancer" (RCReader.com/y/pot3). If you are interested in holding Illinois officials accountable to common sense with regards to "allowing" chronic-pain and PTSD sufferers the option of a non-pharmaceutical treatment, then pick up the phone to your local state legislator and demand information about the Illinois Department of Public Health. Let your legislator know that you support the re-legalization of cannabis, especially for medicinal purposes, and demand to know what they are going to do to force the Department of Public Health to quit carrying water for the pharmaceutical industry. If they don't hear from you, the business of medical marijuana won't be a public benefit in Illinois.